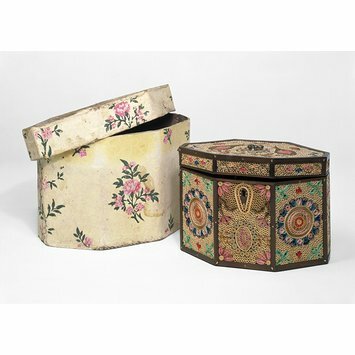 Tea caddies are small boxes used to store loose tea leaves. During the 18th and 19th centuries they were often highly decorative because they were placed on the table as tea was served, and would be seen by guests. Tea was relatively expensive so caddies of that date usually have locks. Being small and light they were ideal for decorating at home. 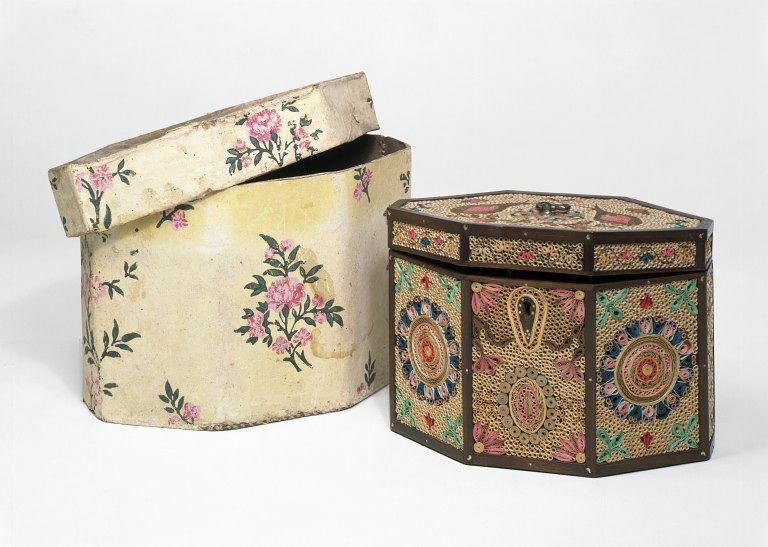 Wooden tea caddies with a raised framework were made by cabinet makers specifically to take filigree paperwork, a popular pastime around 1800. They could be purchased from shops such as The Temple of Fancy at 34 Rathbone Place, London, together with strips of coloured paper and published sheets of designs. This caddy was no doubt home-made from such a kit. The decoration would have taken hours of painstaking work. It is covered in tightly-rolled strips of coloured and gilded paper to create the illusion of metal filigree. It is brightly-coloured and in pristine condition, in complete contrast to most other examples of surviving rolled paperwork which have faded to brown over the years. It was generously given to the V&A in 1981 but can only make an occasional appearance in the galleries. If continuously displayed, it would soon begin to fade. Showing an illustration on the web is an ideal way of displaying it without damage.